I’m very fortunate. Even though I love cooking, there are nights that I just don’t want to spend time in the kitchen. When that happens, Mark is always happy to step in and take care of things. He’s a great cook. This is one of the dinners he cooked up recently. 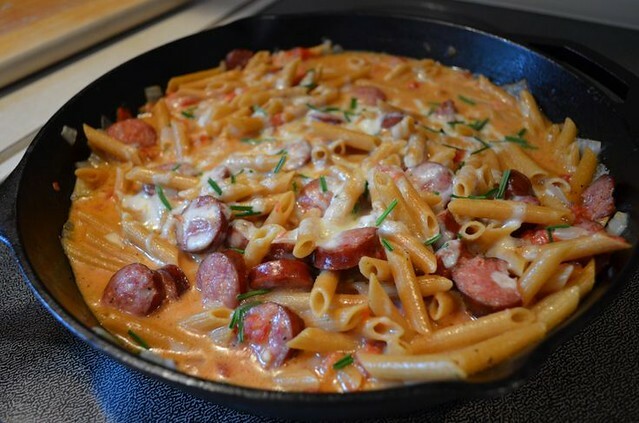 Its a one-pot meal – you don’t have to cook the pasta separately, just keep adding things to the pan and in the end you have a creamy, spicy pasta dish. It was awesome. In a cast iron skillet, heat the oil until smoking. Add the sausage and onion to the pan, and cook until lightly browned, about 4 minutes. Stir in the garlic, and cook for an additional 30 seconds. Add the broth, tomatoes, heavy cream, uncooked pasta and pepper, and stir to combine. Bring to a boil and then cover the skillet and reduce heat to medium-low. Simmer until the pasta is tender, about 15 minutes, stirring once or twice while cooking. While the pasta cooks, preheat the oven broiler. Remove the skillet from the heat and stir in 1 cup of the cheese. Add salt to taste. Top with the scallions and remaining cheese. Broil until the cheese is melted and lightly browned, about 3 minutes. Thank you for this recipe! I just made this with a couple of alterations. I didn’t have any cream, so I used 1/3 of a bottle of Classico Sun-dried tomato alfredo, and I added red and yellow bell peppers. The only thing I will change when I make this again (and I will!) is I will strain the tomato juice out next time. I LOVE jalapeno but it overpowers everything and I can’t taste anything except jalapeno. I will still eat every drop! This tastes even better re-heated & I take back what I said before, I won’t drain the tomato sauce, it is just too good!